The Atlanta University Center District encompasses a group of the country's major institutions of higher learning for African Americans. They have not only pioneered in offering educational opportunities to African Americans, but have been a progressive force in the development of the black community in Atlanta, which in turn, has had considerable impact upon the nation. Located west of Atlanta's central business district, the six colleges of the Atlanta University Center include: Atlanta University; Clark, Morehouse, Morris Brown and Spelman Colleges; and the Interdenominational Theological Center. 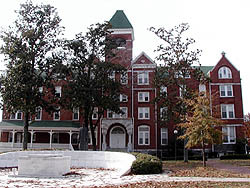 Atlanta University was founded in 1865 as an institution offering a liberal arts education. In 1929, Atlanta University became the graduate school for the affiliated group of colleges. At the northernmost end of the district is the oldest campus, which is now occupied by Morris Brown College. 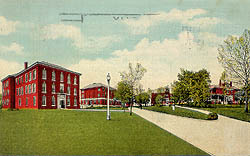 The National Historic Landmark building Stone (Fountain) Hall is located on this campus. One block east and north of the Morris Brown campus is a residential street. This was a part of the original property of Atlanta University on which faculty homes were located. On the western boundary of Morris Brown and the Interdenominational Center are residential streets containing many typical Victorian frame cottages with occasional examples of Eastlake style detailing. Also in the area between the old campus and the later Atlanta University campus are the buildings of the University Homes housing development. These are two-story, red brick buildings with wrought iron balconies above projecting entranceways designed in a modified International style. The southern section of the district is occupied by the quadrangle of Atlanta University's present campus surrounded by Morehouse, Spelman and Clark Colleges. Also located within the boundaries of the Atlanta University Center District are two historic churches. West Hunter Street Baptist Church occupied a late Romanesque Revival building in the northern section of the district until 1972. Friendship Church, in the eastern section, is strongly linked by tradition and history with the district. The Atlanta University Center Historic District is roughly bordered by the transit right-of-way, Northside Dr., Walnut, Fair, Roach, West End Dr., and Euralee and Chestnut sts. The grounds of the University are open to the public. For further information about the Atlanta University Center, visit their affiliated library. The Atlanta University Center Historic District is also highlighted in our Historic Places of the Civil Rights Movement itinerary.